What are the different types of cultural spaces in China and how are they managed? What is the artist’s role in the self-management of artistic production? What is the relationship between the artist and the transformation of the public space, the overpopulation and the exploitation of natural resources in China? How to define the artist’s role towards the public space? These and other related questions have been explored in occasion of the visit of five Chinese artists and curators to Italy, who had been invited by European Alternatives as part of the Transeuropa Festival 2012. Boliang Shen (curator and journalist, Beijing),Ma Yongfeng (artist, Beijing), Ni Kun (curator, Chongqing), You Mi (artist, curator and writer, Beijing) and Zhou Xiahou (artist, Shanghai) took part in a tour across the Italian towns of Rome, Prato and Bologna with the aim of opening a confrontation on the spaces of artistic expression and production between Europe and China. The first meeting took place on 9th May in Rome, at MACRO, one of the leading Italian contemporary art museums. The public roundtable has been moderated by European Alternative’s co-director, Lorenzo Marsili, with an opening address by Maria Alicata, curator at MACRO. The discussion focused on the issue of the rapid, as well as uncontrolled, urban development in China, which is causing physical and psychological displacement in many communities, which have been affected by such sudden changes in the Chinese landscape. Amongst the many interventions, the presentation of Organhaus’ activities by its founder and curator, Ni Kun, deserves particular attention. Organhaus is the first independent artist-run space in the urban conglomerate of Chongqing, a roughly 30 million people megalopolis in the region of Sichuan in Southwest China. Ni Kun has been running several projects involving the inhabitants of small villages, whose identities have been severely questioned by the displacement caused by the sprawling urbanization that affected Chinese countryside. The open engagement of the artist with public, vital issues showed how deeply and seriously the role of the artist might be played in contemporary China. While in Rome, in addition to the public talk at MACRO, the Chinese artists and curators also engaged on informal meetings, such as the one with the occupants of the Teatro Valle. In particular, journalist and curator Boliang Shen and artist Ma Yongfeng exchanged practices and experiences on the management of spaces of cultural production by artists themselves, with a specific reference to the issue of the commons, on which the Teatro Valle Occupato is at the forefront in the European cultural context. Afterwards, all the participants moved to Prato, a town close to Florence, where they had the chance to visit the exhibition “Moving Image in China”, an extensive retrospective on Chinese video-art, hosted at the cutting edge Centro per l’arte contemporanea Luigi Pecci. The participants – and, in particular, the artist Zhou Xiahou, who is one of the pioneer of Chinese video-art and whose work was also featured in the exhibition – have been welcomed by Centro Pecci’s director, Marco Bazzini, who showed the group around the exhibition and with whom the group discussed many social and artistic issues, such as the relationship of the local art community with Prato’s Chinese inhabitants, who are estimated to account for almost a third of the town’s 180,000 residents. The conclusive stage of the Chinese artists’ and curators’ tour in Italy took place in Bologna, during a busy weekend, full of Transeuropa Festival’s events. On Friday 11th May, a public talk was held at Teatrino Clandestino, Bologna’s renowned underground cultural venue, hosted by the curator Fiorenza Menni. In addition to the presence of the artists and curators from China, Elvira Vannini (curator and lecturer at NABA, Milan) and Luigi Galimberti Faussone, acting as moderator, joined the roundtable. This second talk switched the focus to the issue of alternatives and artist-run spaces, building up a confrontation with some more and less recent experiences in China and Europe, such as the well-established Beijing collective Forget Art, run by Ma Yongfeng, and the energetic, albeit curt, experience of MACAO‘s occupation of a skyscraper in the downtown of Milan, as told in the first-hand account of the the curator Elvira Vannini. 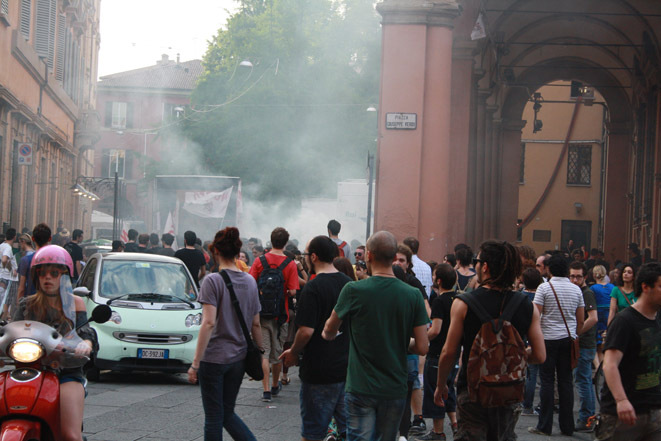 On the following day, while the streets of Bologna were flooded with people, be they coming from the public funeral of a beloved local politician, who tragically committed suicide a few days before, or be they joining a fired up protest against the new government cuts to social spending, artist Ma Yongfeng staged a public intervention in Piazza Verdi, a central square in the university area. With the help of half a dozen volunteers, he went on writing slogans on banners and cardboards with red and black air spray painting. With these slogans, which mostly dealt with current, critical, social and political issues, Ma Yongfeng tried to engage the passers-by, as well as the protesters, in order to build up an extemporaneous transnational Sino-European dialogue on politics through art. The participation of five Chinese artists and curators to the Transeuropa Festival 2012 lies within the broader project “Transnational Dialogues“, of which the next step is a research caravan across the towns of Beijing, Shanghai and Chongqing. This caravan, which is scheduled to take place in early October 2012, involves a large number of artists, researchers, curators and thinkers from China and Europe, who will engage in a research and production trip to map innovative cultural practices, foster new and existing relationships, document, and work towards a sustainable continuation of exchange between cultural innovators in both areas. 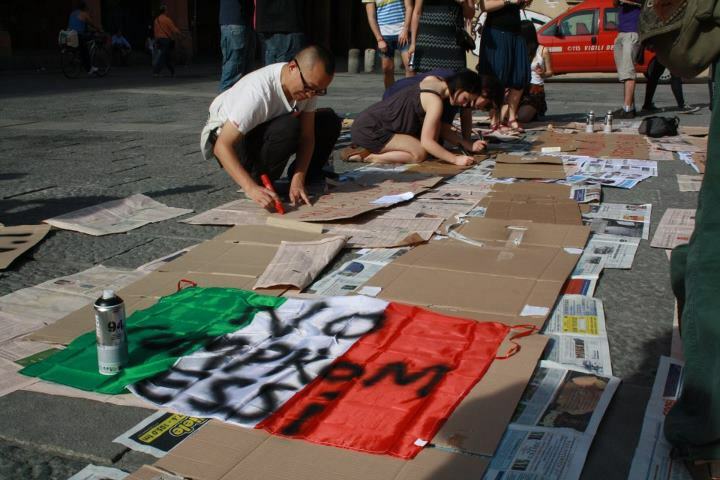 These activities, as well as others that are in preparation, are part of European Alternatives’ efforts to go beyond the European context and to establish mutually fruitful partnerships between artists and spaces of artistic production, dialoguing and working together in Europe, China and South-East Asia.